Saturday, July 14th, 2018 Team Fastrax™ will be performing as part of the opening ceremony of the Quaker State 400. The race is part of the NASCAR Sprint Cup Series, held at Kentucky Speedway in Sparta, KY. 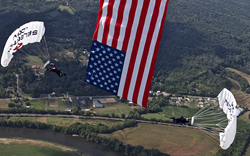 The Quaker State 400 is a NASCAR Sprint Cup Series race held at the Kentucky Speedway in Sparta, KY. Just as fans are getting geared up for the waving of the green flag to start the race, Team Fastrax™ will skydive in with their 1,100 sq. ft. American Flag along with two jumpers with another 1,000 sq. ft. American Flag tethered between them as they race towards the ground at 60 MPH. It will be a breathtaking view from both above and below. According to the Kentucky Speedway website, this weekend’s events will include the Alsco 300 and Buckle Up In Your Truck 225 races. Fans will also be treated to lots of autograph opportunities in the Fan Zone and entertainment on the Trackside Live Stage. This performance of Team Fastrax™ is dedicated to Army Spc. Russell E. Madden. For information on Army Spc. Russell E. Madden, visit the Military Times website. Team Fastrax™ dedicates every performance to a local fallen hero. They may be gone, but are not forgotten. For more information on the race, or to purchase tickets visit the Kentucky Speedway website.